Limited edition of 5000 copies, commemorating the French 1990 Fondation Cartier exhibition, coming with a 24-page booklet made in collaboration with fnac stores, Fondation Cartier and Les Inrockuptibles magazine, including photos of The Velvet Underground, Andy Warhol and Edie Sedgwick by Stephen Shore. Copies sold in the French fnac stores came with a limited numbered promo CDEP in a cardboard sleeve reproducing the first album cover with a peelable banana sticker. The box set was reissued in 1993 without the bonus CDEP. 3-CD set in a long-form digipak with 49-page booklet. Limited edition of 3000 copies. Disc 1 : 1. "Andy Warhol presents..." (0:53) / 2. Extemporisation ("Melody laughter"?) (8:32) / 3. Heroin (7:09) / 4. I'm Waiting For The Man (4:42) / 5. Sunday Morning (2:54) / 6. I'll Be You Mirror (2:11) / 7. Run Run Run (4:23) / 8. All Tomorrow's Parties (5:57) / 9. Venus In Furs (5:08) / 10. Femme Fatale (2:37) / 11. It Was A Pleasure Then (8:02) / 12. From the Music Factory (3:58) / 13. White Light/White Heat (2:45) / 14. Lady Godiva's Operation (4:54) / 15. I Heard Her Call My Name (4:36) / 16. Untitled (4:25) / 17. E.P.I. ad (0:12). 1 : Interview excerpt WNET-TV, NYC February 7, 1966 / 2 : E.P.I. performance, Valleydale Ballroom, Columbus, Ohio, November 4, 1966 / 3-10 : Original mixes from masters of the out-of-print mono version / 11 : Nico's Chelsea Girl LP / 12 : The Music Factory No. 3 / 13-15 : White Light/White Heat / 16 : Andy Warhol's Index Book / 17 : Radio ad for EPI at the Trip, 1966. Disc 2 : 1. Sister Ray (17:27) / 2. Here She Comes (1:58) / 3. Guess I'm Falling In Love (3:51) / 4. Stephanie Says (2:50) / 5. Hey Mr Rain (Version 2) (5:27) / 6. Candy Says (4:05) / 7. Some Kinda Love (3:40) / 8. Pale Blue Eyes (5:42) / 9. Beginning To See The Light (4:47) / 10. I'm Set Free (4:04) / 11. The Murder Mystery (8:57) / 12. Foggy Notion (6:51) / 13. I Can't Stand It (3:23) / 14. Radio Ad (0:58). 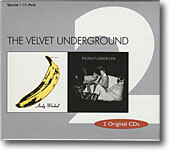 1, 2 : White Light/White Heat / 3, 5 : Another View / 4, 12, 13 : VU / 6-11 : closet mix of The Velvet Underground / 14 : MGM promo single VU-1. Disc 3 : 1. Ocean (5:12) / 2. One Of These Days (3:57) / 3. Introductions (0:48) / 4. Too Much (2:50) / 5. Sweet Jane (Original version) (4:01) / 6. New Age (Original version) (6:34) / 7. Over You (2:16) / 8. What Goes On (8:48) / 9. After Hours (2:51) / 10. I'm Sticking With You (2:39) / 11. Train Round The Bend (3:15) / 12. Head Held High (2:52) / 13. Who Loves The Sun (2:44) / 14. Rock And Roll (4:37) / 15. Ride Into The Sun (demo, from acetate, with vocal) (3:00) / 16. After Hours (2:42) / 17. No More Reunions (0:27) / 18. Thanks Andy Warhol (6:39) / 19. I Love The Velvet Underground (1:04). 1, 2 : VU / 3, 4, 9, 10 : End Of Cole Ave, Dallas, Texas, Oct. 19, 1969 / 5-8 : 1969 Live / 11-14 : Loaded / 15 : liner notes state it's the version from the french CD box set EP, but this is an earlier version, a different mix with vocals of the one available on Another View / 16 : Live At Max's Kansas City / 17 : Interview with Lou Reed on the street, NYC, September 1985 / 18 : WGO #4 flexi disc / 19 : written by Philip Milstein, read by M.C. Kostek, WCEZ-FM Studios, Jupiter Tequesta, Florida, March 1981. 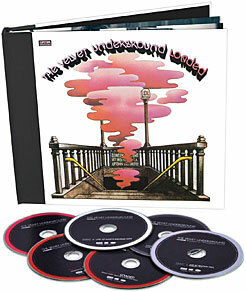 The "Velvet Underground Appreciation Society" review: "Great CD box set from Australia from Raven. They put our pal, the great DejaVUer Dominico Molumby on the case to assemble a legal, licensed comprehensive collection of VU, hits, rarities at al. So he worked 2+ years and tracked down a mono tape of the first album, the closet mix tape from the third, rare live tracks, rare studio tracks. Dom also wrote a fine history/discog of the band. And the results are tremendous. The 'Hits'/best songs are here, but so are the crucial rarities : 8 mono tracks from the 1st LP (the upcoming Polygram box is using the stereo mix of the 1st LP), unreleased live music, flexis, many surprises. It's chock full of what we need on CD, with great liner booknotes. This is released only in Australia, and rare and expensive elsewhere. Even with the Polygram box set looking strong, this is a necessary companion piece done with love by a fan. Go get it." 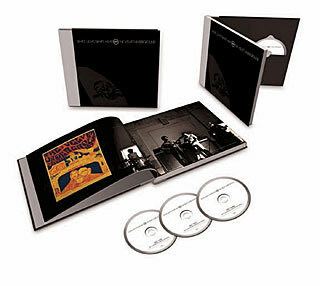 The Ultimate Box: newly digitally remastered versions of the band's four original albums. 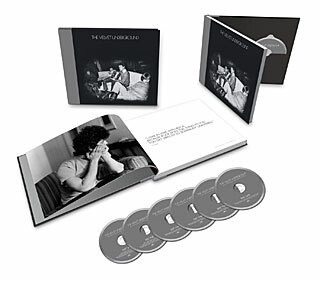 25 previously unreleased recordings: 12 historic demos, 7 'Loaded' out-takes and 6 live performances. Deluxe 6x12 box with re-peelable banana, 88-page, full-color book containing definitive essay, complete credits, dozens of rare photographs and memorabilia. Disc 1 : 1. Venus In Furs [demo] (15:33) / 2. Prominent Men [demo] (4:53) / 3. Heroin [demo] (13:34) / 4. I'm Waiting For The Man [demo] (9:50) / 5. Wrap Your Troubles In Dreams [demo] (15:50) / 6. All Tomorrow's Parties [demo] (18:26). 1-6: recorded July 1965 at John Cale's Ludlow Street loft in Lower Manhattan. Disc 2 : 1. All Tomorrow's Parties [mono single version] (2:49) / 2. Sunday Morning (2:54) / 3. I'm Waiting For The Man (4:38) / 4. Femme Fatale (2:37) / 5. Venus In Furs (5:10) / 6. Run Run Run (4:19) / 7. All Tomorrow's Parties (5:58) / 8. Heroin (7:10) / 9. There She Goes Again (2:39) / 10. I'll Be Your Mirror (2:12) / 11. The Black Angel's Death Song (3:12) / 12. European Son (7:47) / 13. Melody Laughter [live] (10:43) / 14. It Was A Pleasure Then (8:02) / 15. Chelsea Girls (7:24). 1: first single (Verve VK-10427), released July 1966 / 2-12: The Velvet Underground & Nico, first album (Verve V/V6-5008), released March 1967 / 13: recorded live November 4, 1966 at the Valleydale Ballroom, Columbus, Ohio / 14-15: taken from the album Nico: Chelsea Girl (Verve V/V6-5032), originally released October 1967. Disc 3 : 1. There Is No Reason [demo] (2:12) / 2. Sheltered Life [demo] (2:52) / 3. It's All Right (The Way That You Live) [demo] (2:48) / 4. I'm Not Too Sorry (Now That You're Gone) [demo] (2:17) / 5. Here She Comes Now [demo] (2:46) / 6. Guess I'm Falling In Love [live] (4:10) / 7. Booker T. [live] (6:30) / 8. White Light/White Heat (2:45) / 9. The Gift (8:17) / 10. Lady Godiva's Operation (4:54) / 11. Here She Comes Now (2:02) / 12. I Heard Her Call My Name (4:36) / 13. Sister Ray (17:27) / 14. Stephanie Says (2:49) / 15. Temptation Inside Your Heart (2:30) / 16. Hey Mr. Rain (Version One) (4:40). 1-5: demo acetate, recorded early 1967 at John Cale's Ludlow Street loft in Lower Manhattan / 6-7: recorded live in April 1967 at the Gymnasium, New York City / 8-13: White Light/White Heat, second album (Verve V/V6-5046), released January 1968 / 14-15: taken from VU (Verve 823-721-2), released February 1985 / 16: taken from Another View (Verve 829 405-2), released July 1986. Disc 4 : 1. What Goes On [live] (5:34) / 2. Candy Says (4:04) / 3. What Goes On (4:35) / 4. Some Kinda Love (3:39) / 5. Pale Blue Eyes (5:42) / 6. Jesus (3:24) / 7. Beginning To See The Light (4:47) / 8. I'm Set Free (4:04) / 9. That's The Story Of My Life (2:02) / 10. The Murder Mystery (8:55) / 11. After Hours (2:09) / 12. Foggy Notion (6:47) / 13. I Can't Stand It (3:22) / 14. I'm Sticking With You (2:28) / 15. One Of These Days (4:00) / 16. Lisa Says (2:57) / 17. It's Just Too Much [live] (2:59) / 18. Countess From Hong Kong [demo] (3:17). 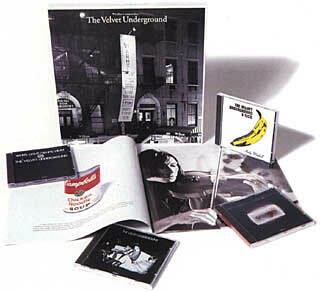 1: recorded live October 4, 1968 at La Cave, Cleveland, Ohio / 2-11: The Velvet Underground alternate 'closet mix' version, third album (MGM SE 4617), released March 1969 / 12-16: taken from VU (Verve 823 721-2), released February 1985 / 17: recorded live October 19, 1969 at The End of Cole Ave., Dallas, Texas / 18: recorded late 1969. Disc 5 : 1. Who Loves The Sun (2:45) / 2. Sweet Jane [full length version] (4:06) / 3. Rock And Roll (4:43) / 4. Cool It Down (3:04) / 5. New Age [full length version] (5:07) / 6. Head Held High (2:56) / 7. Lonesome Cowboy Bill (2:43) / 8. I Found A Reason (4:15) / 9. Train Round The Bend (3:21) / 10. Oh! Sweet Nuthin' (7:25) / 11. Satellite Of Love (2:58) / 12. Walk And Talk (2:23) / 13. Oh Gin (2:44) / 14. Sad Song (3:30) / 15. Ocean (5:43) / 16. Ride Into the Sun (3:20) / 17. Some Kinda Love [live] (10:22) / 18. I'll Be Your Mirror [live] (2:06) / 19. I Love You (2:03). 1-10: Loaded, fourth album (Cotillion SD 9034), released September 1970 / 11-16 & 19: Loaded out-takes / 17-18: recorded live August 23, 1970 at Max's Kansas City, New York City. 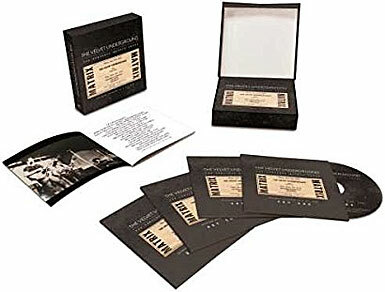 4-CD set compiling 1971-1973 post-Lou live recordings with Doug Yule, Maureen Tucker, Willie Alexander, Walter Powers, Rob Norris, George Kay, Mark Nauseef, Billy Yule, Don Silverman. All material licensed exclusively through the Doug Yule Archives. Re-mastered at Peace Music, Tokyo. Engineered by Souichirou Nakamura. Art direction and package design by Studio LooLeeLoo. This project was developed and produced by Kiyohiro Shiroya with Sal Mercuri. 48-page booklet with liner notes by Doug Yule, lyrics in English and Japanese, color and b&w photos. Limited edition of 1000. Disc One: 1. Chapel Of Love (1:35) / 2. I'm Waiting For The Man (5:53) / 3. Spare Change (3:50) / 4. Some Kinda Love/Turn On Your Love Light (12:46) / 5. White Light/White Heat (5:49) / 6. Pretty Tree Climber (5:32) / 7. Rock And Roll (4:42) / 8. Back On The Farm (6:48) / 9. Dopey Joe (3:02) / 10. Sister Ray/Never Going Back To Georgia (13:15) / 11. After Hours (3:27). 1-11: November 5, 1971, School Of African And Oriental Studies, London, England. Disc Two: 1. I'm Waiting For The Man (4:54) / 2. Spare Change (3:32) / 3. Some Kinda Love (6:51) / 4. White Light/White Heat (4:33) / 5. Hold On (4:58) / 6. What Goes On (4:02) / 7. Cool It Down (4:07) / 8. Back On The Farm (7:04) / 9. Oh Sweet Nuthin' (8:21) / 10. Sister Ray (14:45) / 11. After Hours (3:20) / 12. Dopey Joe (3:23) / 13. Rock And Roll (4:43). 1-13: November 19, 1971, Concergebouw, Amsterdam, Netherlands. Disc Three: 1. I'm Waiting For The Man (5:41) / 2. White Light/White Heat (2:11) / 3. Some Kinda Love (5:51) / 4. Little Jack (3:33) / 5. Sweet Jane (3:41) / 6. Mean Old Man (2:59) / 7. Run Run Run (6:16) / 8. Caroline (2:32) / 9. Dopey Joe (3:10) / 10. What Goes On (4:14) / 11. Sister Ray/Train Round The Band (14:01) / 12. Rock And Roll (4:39) / 13. I'm Waiting For The Man (5:43). 1-13: December 6, 1972, St David's University, Lampeter, Wales. Disc Four: 1. I'm Waiting For The Man (4:37) / 2. Little Jack (3:30) / 3. White Light/White Heat (4:50) / 4. Caroline (2:55) / 5. Sweet Jane (4:21) / 6. Mean Old Man (2:53) / 7. Who's That Man (4:07) / 8. Let It Shine (4:33) / 9. Mama's Little Girl (3:40) / 10. Train Round The Band (2:15) / 11. White Light/White Heat (4:21) / 12. What Goes On (4:06) / 13. Cool It Down (4:12) / 14. Oh Sweet Nuthin' (7:54). 1-10: Oliver's, Boston, Massachussets / 11-14: radio broadcast version of Disc Two. See special feature for details. 1. Sunday Morning (2:55) / 2. I'm Waiting For The Man (4:39) / 3. Femme Fatale (2:38) / 4. Venus In Furs (5:12) / 5. Run Run Run (4:22) / 6. All Tomorrow's Parties (5:59) / 7. Heroin (7:13) / 8. There She Goes Again (2:41) / 9. I'll Be Your Mirror (2:14) / 10. The Black Angel's Death Song (3:12) / 11. European Son (7:47). 12. All Tomorrow's Parties [alternate single voice version] (5:57) / 13. European Son [alternate version] (9:06) / 14. Heroin [alternate version] (6:17) / 15. All Tomorrow's Parties [alternate instrumental mix] (5:51) / 16. I'll Be Your Mirror [alternate mix] (2:20). 1. Sunday Morning (2:55) / 2. I'm Waiting For The Man (4:46) / 3. Femme Fatale (2:38) / 4. Venus in Furs (5:13) / 5. Run Run Run (4:24) / 6. All Tomorrow's Parties (5:59) / 7. Heroin (7:14) / 8. There She Goes Again (2:41) / 9. I'll Be Your Mirror (2:14) / 10. The Black Angel's Death Song (3:12) / 11. European Son (7:57). 12. All Tomorrow's Parties (2:51) / 13. I'll Be Your Mirror [alternate ending] (2:18) / 14. Sunday Morning [alternate mix] (3:13) / 15. Femme Fatale (2:40). 1. The Fairest Of The Seasons (4:10) / 2. These Days (3:34) / 3. Little Sister (4:27) / 4. Winter Song (3:20) / 5. It Was a Pleasure Then (8:06) / 6. Chelsea Girls (7:27) / 7. I'll Keep It With Mine (3:21) / 8. Somewhere There's A Feather (2:20) / 9. Wrap Your Troubles In Dreams (5:10) / 10. Eulogy To Lenny Bruce (3:46). 10. Walk Alone (3:27) / 11. Cracking Up / Venus in Furs (3:52) / 12. Miss Joanie Lee (11:49) / 13. Heroin (6:14) / 14. There She Goes Again [with Nico] (2:09) / 15. There She Goes Again (2:56). 1. Melody Laughter (28:26) / 2. Femme Fatale (2:37) / 3. Venus In Furs (4:45) / 4. The Black Angel's Death Song (4:49) / 5. All Tomorrow's Parties (5:03). 1. Waiting For The Man (4:50) / 2. Heroin (6:42) / 3. Run Run Run (8:43) / 4. The Nothing Song (27:56). 1. White Light/White Heat (2:47) / 2. The Gift (8:19) / 3. Lady Godiva's Operation (4:56) / 4. Here She Comes Now (2:05) / 5. I Heard Her Call My Name (4:38) / 6. Sister Ray (17:31). 7. I Heard Her Call My Name [alternate take] (4:39) / 8. Guess I'm Falling In Love [instrumental version]* (3:34) / 9. Temptation Inside Your Heart [original mix] (2:32) / 10. Stephanie Says [original mix] (2:49) / 11. Hey Mr. Rain [version one]* (4:40) / 12. Hey Mr. Rain [version two]* (5:24) / 13. Beginning To See The Light [previously unreleased early version] (3:39). 1. White Light/White Heat (2:47) / 2. The Gift (8:17) / 3. Lady Godiva's Operation (4:55) / 4. Here She Comes Now (2:03) / 5. I Heard Her Call My Name (4:37) / 6. Sister Ray (17:31). 7. White Light/White Heat [mono single mix] (2:48) / 8. Here She Comes Now [mono single mix] (2:03) / 9. The Gift [vocal version] (8:07) / 10. The Gift [instrumental] (8:16). 1. Booker T. (6:45) / 2. I'm Not A Young Man Anymore (6:16) / 3. Guess I'm Falling In Love (4:09) / 4. I'm Waiting For The Man (5:27) / 5. Run Run Run (6:58) / 6. Sister Ray (19:03) / 7. The Gift (10:24). 1. Candy Says / 2. What Goes On / 3. Some Kinda Love / 4. Pale Blue Eyes / 5. Jesus / 6. Beginning To See The Light / 7. I'm Set Free / 8. That's The Story Of My Life / 9. The Murder Mystery / 10. After Hours. 1. Candy Says / 2. What Goes On / 3. Some Kinda Love / 4. Pale Blue Eyes / 5. Jesus / 6. Beginning To See The Light / 7. I'm Set Free / 8. That's The Story Of My Life / 9. The Murder Mystery / 10. After Hours / 11. Beginning To See The Light [alternate closet mix]. 11. What Goes On / 12. Jesus. 1. Foggy Notion [original 1969 mix]* / 2. One Of These Days [new 2014 mix]* / 3. Lisa Says [new 2014 mix]* / 4. I'm Sticking With You [original 1969 mix]* / 5. Andy's Chest [original 1969 mix]* / 6. Coney Island Steeplechase [new 2014 mix] (2:36)* / 7. Ocean [original 1969 mix] / 8. I Can't Stand It [New 2014 mix]* / 9. She's My Best Friend [original 1969 mix]* / 10. We're Gonna Have A Real Good Time Together [new 2014 mix]* / 11. I'm Gonna Move Right In [original 1969 mix] / 12. Ferryboat Bill [original 1969 mix] / 13. Rock & Roll [original 1969 mix] / 14. Ride Into The Sun [new 2014 mix]*. 1. I'm Waiting For The Man* / 2. What Goes On* / 3. Some Kinda Love** / 4. Over You* / 5. We're Gonna Have A Real Good Time Together* / 6. Beginning To See The Light** / 7. Lisa Says** / 8. Rock & Roll** / 9. Pale Blue Eyes* / 10. I Can't Stand It Anymore* / 11. Venus In Furs* / 12. There She Goes Again*. 1. Sister Ray*** / 2. Heroin* / 3. White Light/White Heat** / 4. I'm Set Free* / 5. After Hours* / 6. Sweet Jane**. 1. Who Loves The Sun (2:46) / 2. Sweet Jane (Full-Length Version) (4:06) / 3. Rock & Roll (Full-Length Version) (4:43) / 4. Cool It Down (3:05) / 5. New Age (5:10) / 6. Head Held High (2:57) / 7. Lonesome Cowboy Bill (2:44) / 8. I Found A Reason (4:16) / 9. Train Round The Bend (3:21) / 10. Oh! Sweet Nuthin' (7:29). Session Outtakes: 11. I'm Sticking With You (Remix) (2:53) / 12. Ocean (5:45) / 13. I Love You (2:54) / 14. Ride Into The Sun (3:26). 1. Who Loves The Sun (2:45) / 2. Sweet Jane (3:15) / 3. Rock & Roll (4:38) / 4. Cool It Down (3:03) / 5. New Age (4:46) / 6. Head Held High (2:55) / 7. Lonesome Cowboy Bill (2:42) / 8. I Found A Reason (4:14) / 9. Train Round The Bend (3:18) / 10. Oh! Sweet Nuthin' (7:24). Additional Material: 11. Who Loves The Sun (Single A-side 45-44107) (2:48) / 12. Oh! Sweet Nuthin' (Single B-side 45-44107) (7:26) / 13. Rock & Roll (Unissued Single A-side 45-44133) (3:05) / 14. Lonesome Cowboy Bill (Unissued Single B-side 45-44133) (2:40). 1. Rock & Roll (Demo) (4:42) / 2. Sad Song (Demo) (3:31) / 3. Satellite Of Love (Demo) (3:00) / 4. Walk And Talk (Demo) (2:25) / 5. Oh Gin (Demo) (2:45) / 6. Ocean (Demo) (6:05) / 7. I Love You (Demo) (2:09) / 8. Love Makes You Feel Ten Feet Tall (Demo) (Remix) (4:15) / 9. I Found A Reason (Demo) (3:17) / 10. Cool It Down (Early Version) (Remix) (4:20) / 11. Sweet Jane (Early Version) (Remix) (5:31) / 12. Lonesome Cowboy Bill (Early Version) (Remix) (3:19) / 13. Head Held High (Early Version) (Remix) (2:56) / 14. Oh! Sweet Nuthin' (Early Version) (Remix) (4:04) / 15. Who Loves The Sun (Alternate Mix) (3:05) / 16. Sweet Jane (Alternate Mix) (4:23) / 17. Cool It Down (Alternate Mix) (3:28) / 18. Lonesome Cowboy Bill (Alternate Mix) (2:42) / 19. Train Round The Bend (Alternate Mix) (4:39) / 20. Head Held High (Alternate Mix) (2:15) / 21. Rock & Roll (Alternate Mix) (4:40). 1. I'm Waiting For The Man (4:44) / 2. WhiteLight/White Heat (5:15) / 3. I'm Set Free (6:27) / 4. Sweet Jane (6:17) / 5. Lonesome Cowboy Bill (4:20) / 6. New Age (6:38) / 7. Beginning To See The Light (5:42) / 8. I'll Be Your Mirror (3:27) / 9. Pale Blue Eyes (6:01) / 10. Candy Says (5:50) / 11. Sunday Morning (3:39) / 12. After Hours (2:58) / 13. Femme Fatale (3:09) / 14. Some Kinda Love (11:03) / 15. Lonesome Cowboy Bill (Version 2) (4:17). 1. I'm Waiting For The Man (6:12) / 2. What Goes On (5:26) / 3. Cool It Down (6:06) / 4. Sweet Jane (7:08) / 5. Rock & Roll (7:31) / 6. Some Kinda Love (4:24) / 7. New Age (7:29) / 8. Candy Says (5:05) / 9. Head Held High (4:15) / 10. Train Round The Bend (4:30) / 11. Oh! Sweet Nuthin' (7:36). 1. Who Loves The Sun (2:54) / 2. Sweet Jane (4:23) / 3. Rock & Roll (4:48) / 4. Cool It Down (3:54) / 5. New Age (5:52) / 6. Lonesome Cowboy Bill (3:00) / 7. I Found A Reason (4:15)* / 8. Head Held High (2:59)* / 9. Train Round The Bend (4:30) / 10. Oh! Sweet Nuthin' (7:26). * Producer's Note: Loaded 5.1 Sound Sound Remix and Downmix tracklistings have been slightly resequenced to include the originally planned I Found A Reason/Head Held High segue. 1. Who Loves The Sun (2:50) / 2. Sweet Jane (3:17) / 3. Rock & Roll (4:40) / 4. Cool It Down (3:05) / 5. New Age (4:40) / 6. Head Held High (2:52) / 7. Lonesome Cowboy Bill (2:48) / 8. I Found A Reason (4:15) / 9. Train Round The Bend (3:20) / 10. Oh! Sweet Nuthin' (7:23). 1. I'm Waiting For The Man (Version 1) (13:07) / 2. What Goes On (Version 1) (8:53) / 3. Some Kinda Love (Version 1) (4:58) / 4. Heroin (Version 1) (8:07) / 5. The Black Angel's Death Song (6:20) / 6. Venus In Furs (Version 1) (4:38) / 7. There She Goes Again (Version 1) (3:13) / 8. We're Gonna Have A Real Good Time Together (Version 1) (3:20) / 9. Over You (Version 1) (2:24) / 10. Sweet Jane (Version 1) (5:12) / 11. Pale Blue Eyes (6:05) / 12. After Hours (Version 1) (2:58). 1. I'm Waiting For The Man (Version 2) (6:33) / 2. Venus In Furs (Version 2) (5:11) / 3. Some Kinda Love (Version 2) (4:04)) / 4. Over You (Version 2) (3:02) / 5. I Can't Stand It (Version 1) (7:54) / 6. There She Goes Again (Version 2) (2:50) / 7. After Hours (Version 2) (2:30) / 8. We're Gonna Have A Real Good Time Together (Version 2) (3:40) / 9. Sweet Bonnie Brown (7:50) / 10. Heroin (Version 2) (10:05) / 11. White Light/White Heat (Version 1) (9:27) / 12. I'm Set Free (4:48). 1. We're Gonna Have A Real Good Time Together (Version 3) (3:15) / 2. Some Kinda Love (Version 3) (3:15) / 3. There She Goes Again (Version 3) (4:38) / 4. Heroin (Version 3) (8:28) / 5. Ocean (10:59) / 6. Sister Ray (36:54). 1. I'm Waiting For The Man (Version 3) (5:31) / 2. What Goes On (Version 2) (4:31) / 3. Some Kinda Love (Version 4) (4:03)) / 4. We're Gonna Have A Real Good Time Together (Version 4) (3:24) / 5. Beginning To See The Light (5:30) / 6. Lisa Says (6:00) / 7. New Age (6:28) / 8. Rock & Roll (6:54) / 9. I Can't Stand It (Version 2) (6:52) / 10. Heroin (Version 4) (8:18) / 11. White Light/White Heat (Version 2) (8:43) / 12. Sweet Jane (Version 2) (4:20). All tracks (supposedly) recorded live at The Matrix, San Francisco CA on November 26 & 27, 1969. 24-page booklet including liner notes by David Fricke. 3-CD set, Polygram 849 546-2, France, 199? RFM radio special issue including 80s editions of The Velvet Underground And Nico, White Light White Heat and VU. Special price 2-CD long box with liner notes in French, including German editions of Loaded (Atlantic 7567-90367-2) and Live At Max's Kansas City (Atlantic 7567-90370-2). 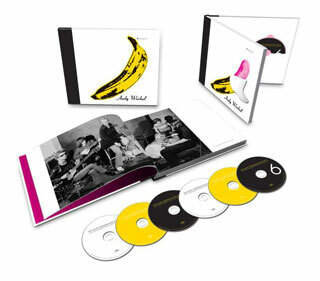 Hardback long box including the discs and booklets of the 1996 US editions of The Velvet Underground & Nico (Polygram 31453 1250 2), White Light/White Heat (Polygram 31453 1251 2), and The Velvet Underground (Polygram 31453 1252 2).